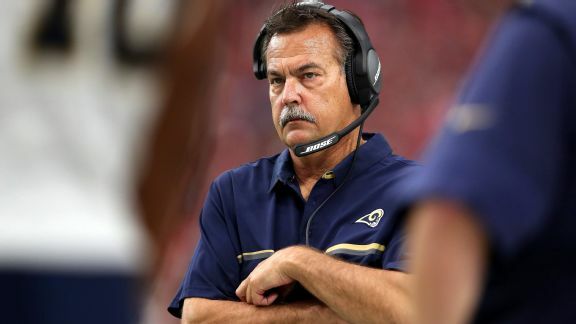 THOUSAND OAKS, Calif. -- The Los Angeles Rams parted ways with embattled coach Jeff Fisher on Monday, a decision Rams COO Kevin Demoff chalked up to "an organizational failure" and one he said was "solely a performance-related issue." Special-teams coordinator John Fassel, son of longtime NFL coach Jim Fassel, will step in as the interim coach for the final three games, with the next coming on the road Thursday against the Seattle Seahawks. General manager Les Snead, who, like Fisher, signed an extension through 2018 before the start of this season, is not guaranteed to return, and neither are any of Fisher's coaches. "Starting today, we'll have a complete review of the entire organization," Demoff said during a 45-minute news conference at the Rams' facility. "We sat down with Les, and again, this team is not where it needs to be. And we need to own up to that from a coaching perspective, from a personnel perspective, from an administration perspective. I think all of us need to get better." Fisher's firing came one day after a 42-14 blowout loss at home to the Atlanta Falcons. It was the Rams' third consecutive lopsided defeat, and it put the team at 4-9 and handed Fisher his 165th career loss, tying Dan Reeves for the NFL record. In a statement, Rams owner Stan Kroenke said he has "great respect for Jeff as a coach, person, father and friend," then thanked him for working "tirelessly despite some challenging circumstances." "However," Kroenke said, "this is the right time to make a change, as our performance has not lived up to my or our fans' expectations. We all are focused on improving as an organization and building a team that makes Los Angeles proud." The Rams have dropped eight of their past nine games and have guaranteed themselves a 10th consecutive losing season. Under Fisher, who has six consecutive losing seasons, the Rams have not finished better than 7-8-1. Since Fisher took over in 2012, the organization has been plagued by an ineffective offense and a continual rash of penalties. "This was solely a performance-related issue," Demoff said of Fisher, who had a winning record in six of his 20 prior full seasons as an NFL head coach. "And when you look at the team, and where it is, and how we get better moving forward -- for the fans, for the players, for the coaches, for the organization -- we wanted to make sure games like yesterday didn't happen again." Demoff said the process of finding a new coach will begin in earnest Tuesday. The hope is to have somebody in place by the middle of January, but the Rams are open-minded about the timeline. They're also open-minded about the identity of the next candidate. "I think the obvious thing people are going to say is, 'Well, you're going to hire an offensive coach because you had a defensive coach' or 'The offense is bad,'" Demoff said. "I think we need to find the best head coach for the Los Angeles Rams. Whether that's an offensive coach, a defensive coach, a special-teams coach, the interim coach, a college coach, I think we have to be willing to look under every possible avenue to find the right fit to go lead this football team." In the interim, it will be Fassel, whose father, Jim, coached the New York Giants from 1997 to 2003 and was named NFL coach of the year in his first season. John Fassel has been the Rams' special-teams coordinator for five years and held the same job with the Oakland Raiders from 2009 to 2011. Fassel didn't necessarily have aspirations of becoming a head coach, and he admitted to being taken by surprise when the Rams chose him. Asked if he believes there is anything he can show the Rams during these final three games that would give him a shot at being the head coach, Fassel simply said, "No." "I think Coach Fassel carries tremendous respect from our players and carries tremendous respect from our coaches," Demoff said. "He'll bring tremendous energy. And this is about getting the most out of our group for the last few games." Fisher addressed the players shortly after he found out, and the locker room was genuinely crushed to hear the news. Fisher angered the fan base, but he had the overwhelming respect of his players. Middle linebacker Alec Ogletree called the firing "a hard pill to swallow." Offensive lineman Jamon Brown got emotional when talking about how well Fisher handled the criticism in recent days. Defensive tackle Aaron Donald said the struggles are "on us. It's on us as players." Several others talked about how they let Fisher down by not playing well enough for him to keep his job. "I think I speak for the whole team when I say he was very well-liked and very giving," quarterback Jared Goff said. "I mean, he treated us the right way. He treated us the way we're supposed to be treated, and in return, we didn't do enough for him. And that's really what it comes down to." Fisher's firing comes eight days after news of his extension leaked to the media, a circumstance the Rams were never excited to get behind. Jeff Fisher had 45 losses as the Rams' head coach, tied for the second-most by a head coach since the start of the 2012 season. When Kroenke first gave Fisher an extension, the thought was that he could at least lead the Rams into their new stadium in Inglewood, California, for 2019, and there was a sentiment within the front office that it would be unfair to judge Fisher until he was at least a full year removed from the relocation and had time to groom Goff. Then the Rams' first season in Los Angeles unraveled, starting with a blowout loss to the San Francisco 49ers on Monday Night Football and continuing with eight losses in a span of nine games. There was controversy with Hall of Fame running back Eric Dickerson, who was infuriated by a phone call from Fisher in which Fisher allegedly denied him sideline passes. Then there were Fisher's comments about being "unaware" that Snead, his GM the past five years, had also signed an extension, which reportedly rubbed people in the organization the wrong way. Demoff said the Rams gave Fisher and Snead extensions because they didn't want them to go into the first season of a relocation with lame-duck status. The extensions were agreed to in the summer, but it took a bit longer for the paperwork to get worked out. Then the season started, and Demoff didn't want to announce the extensions because they could have created what he called "a distraction." "Maybe that was a mistake on my part," Demoff said. As the season went on, the Rams faced increasing pressure from the outside to make a change at coach. "I think it would be easy to say that played into it," Demoff said. "I think what that overlooks is the fact that all of that is generated off the won-loss record. And when you look at the fans, when you look at anything that's happened these past few weeks, everybody's been frustrated about losing eight out of nine and having some tough losses. And it all comes down to how we're performing on the field."